Full skirts and their infinite variations can be the quickest and most satisfying sewing project, whip-uppable in under an hour. That is, once you’ve mastered the basics that make up a skirt’s skeleton, namely inserting an invisible zipper which we’ve already covered here, and attaching a waistband. 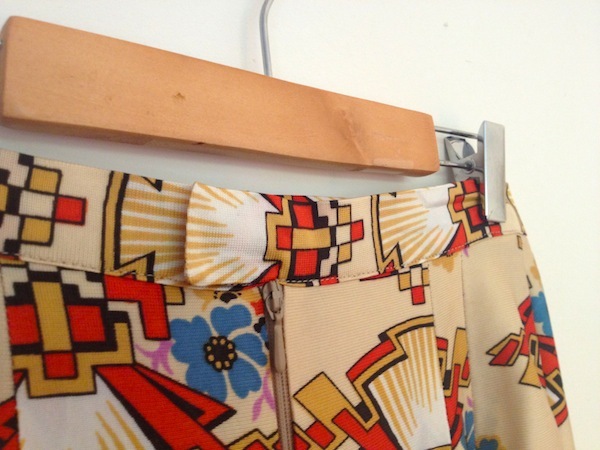 The following tutorial covers two ways to make a perfect waistband. This super basic waistband simply serves to finish and neaten the topline of a skirt by enclosing its raw edge. This waistband is best suited for a centre back closure as it meets perfectly at the ends, to be fastened with a hook & eye. 1. 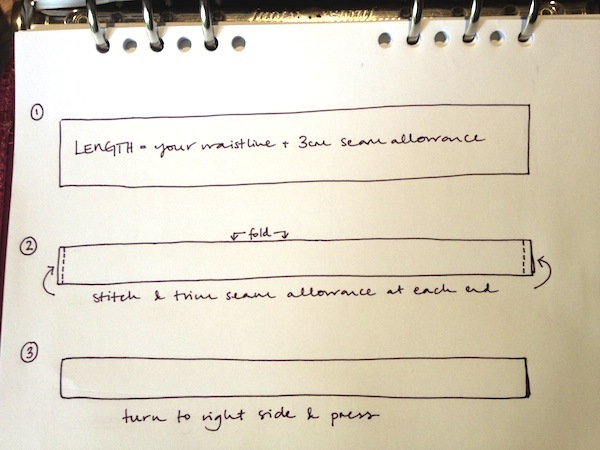 Cut a length of fabric that equals your waistline measurement + 3cm seam allowance (1.5cm at each end). Make sure you cut the fabric on the straight to avoid the fibres stretching. An easy way to be sure you are cutting on the straight is by checking that the individual threads that make up the fabric are at a right angle to your cutting lines. TIP: Try experimenting with the width of your waistband to create a different look. 2. With right sides together, fold the length of fabric in half lengthways. Stitch each end remembering to backstitch and leaving 1.5cm seam allowance. Trim excess seam allowance with pinking shears. 3. Turn your waistband to the right side and press fold and seams. Hand sew a hook & eye at each end to fasten the waistband. It is now ready to attach to a skirt (see below)! Similar to the basic waistband, but with a little flap fastening. Best suited to a side seam closure to avoid asymmetry at the centre back. 1. 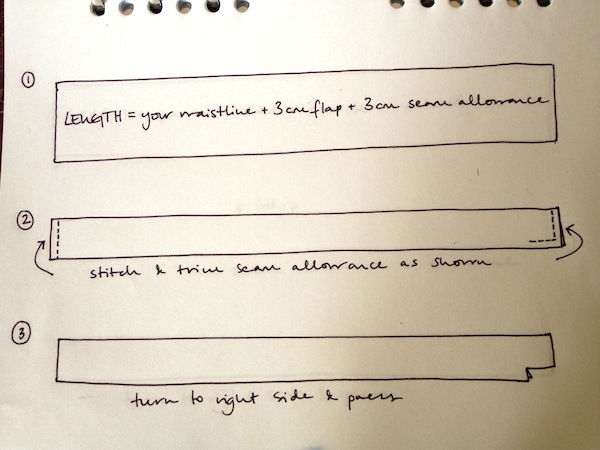 Cut a length of fabric that equals your waistline measurement + 3cm flap + 3cm seam allowance (1.5cm at each end). As above, make sure that you cut your fabric on the straight. 2. With right sides together, fold the length of fabric in half lengthways. Stitch one end completely, leaving 1.5cm seam allowance, and the other end in a reverse “L” shape as shown – leaving 1.5cm seam allowance all round and stitching 3cm in towards the centre of your waistband. 3. Turn your waistband to the right side and press fold and seams. Hand sew a hook & eye to the flap to fasten the waistband. It is now ready to attach to a skirt (see below)! 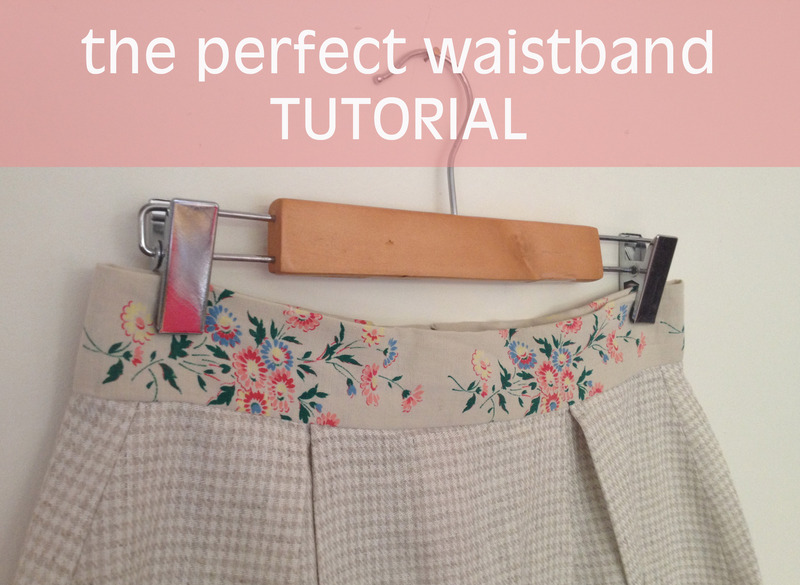 There are quite a few different ways to attach a waistband to a skirt. The easiest of which is to simply pin the raw, open length of the band to the right side of the skirt’s waistline and machine stitch into place. While this technique is perfectly acceptable, we are always slightly irked by the messy exposed seam on the inside… If like us, you like to finish things a little more flawlessly, we recommend first machine stitching one of the raw edges to the right side of the skirt’s waistline (fig. 1), then folding the waistband over (fig. 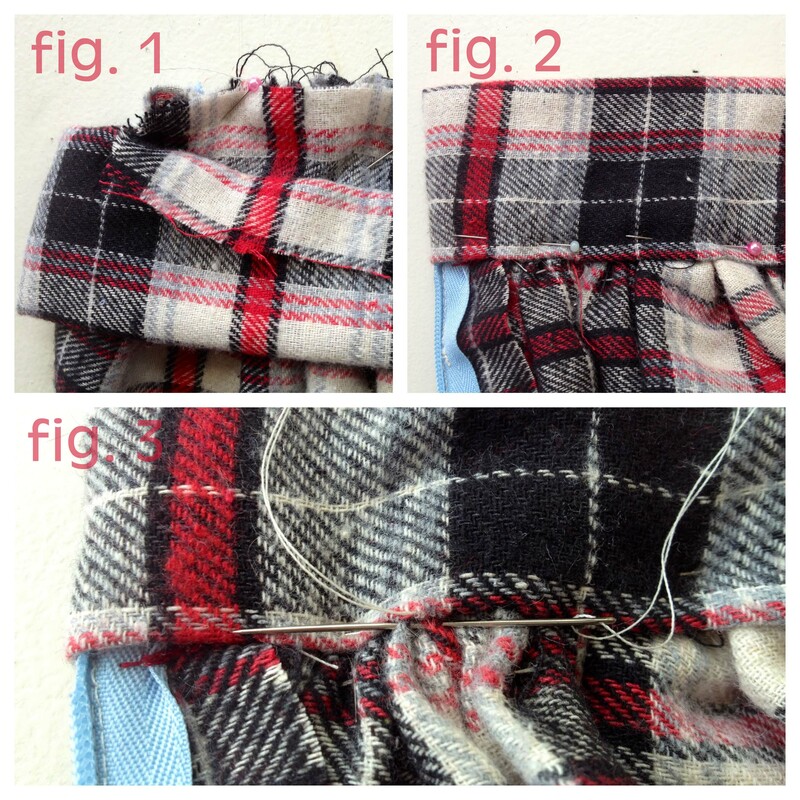 2) and blind stitching the inside edge (fig. 3). This gives a flawless finish and perfectly ensconces the topline of the skirt. 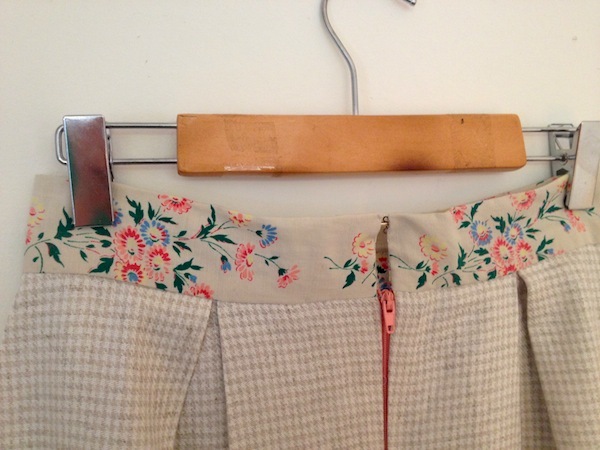 This entry was posted on October 4, 2012 by byhandlondon in Sewing tutorial and tagged sewing, skirt, technique, tutorial, waistband.